HomeDigital ComicsAndroid ComicsGet The Free Digital Action Pack From Top Shelf Now! 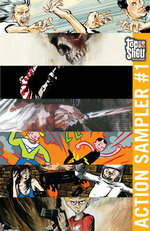 Get The Free Digital Action Pack From Top Shelf Now! Savvy to digital comics and looking for something new to read? Curious about e-reading and hesitant to take the plunge? Look no further than the Top Shelf Action Pack, packed with 168 pages of our most thrilling comics, and yours for the price of ZERO! Inside are full chapters from seven graphic novels: Infinite Kung Fu, The Homeland Directive, Lost Dogs, From Hell,SuperF*ckers, Bighead, and Any Empire! It’s available on Comixology and iVerse now, with more formats coming soon. Check it out! Dark Horse Digital One Year Anniversary Sale!